My idea came from my little boy's name, "JACK"! I figured a Jack in the Box would be fitting since he was unable to walk at the time. Very easy to make - one cardboard box with a hole cut out on top. I did not add holes for the legs since he was not walking. 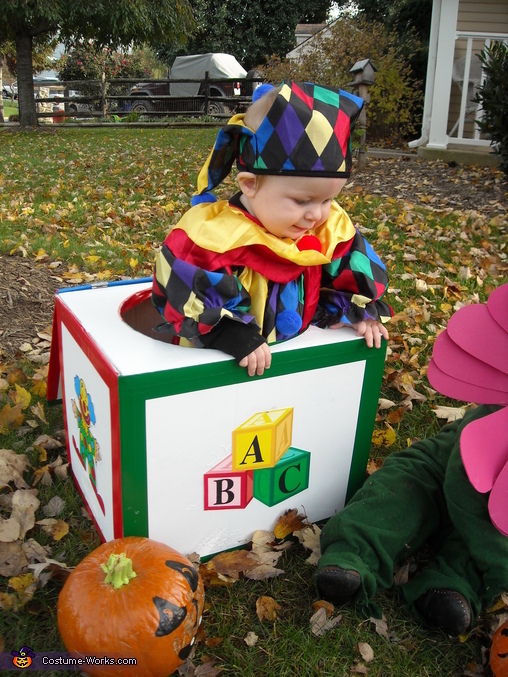 Perfect, because he just sat/stood in the box while we handed out candy. I use colored electrical tape to line the edges of the box and printed images from online and pasted on all sides. I used a separate piece of cardboard for the lid, lined with tape, added a clown image then hinged together to top of box. I found a jester costume cheap and re-sized to fit my little man. Very cute, easy and cheap to do!